While resurrecting this blog I found the only post that I had not published. I’ve checked this out online and it is still relevant. So, here goes. So I’m eating a lot fewer burgers and only using my scooter for getting around–no fun runs in the last two years. I’m trying to eat healthy and use my bicycle whenever I can. This blog–if anyone visit it anymore–has lost it author. This post is kind of different. I recently discovered a dive in Midtown Sacramento. 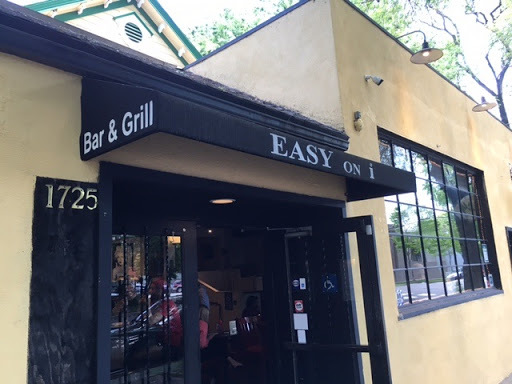 Easy on i is a fun–beer-centric dive at 1725 I Street in Sacramento. Think The Golden Bear, then replace the beautiful thirtysomethings with older local color and saw two bucks off of each similar menu item. I discovered this nondescript place while on one of my lunch-time health walks. (Did you think I was BSing you about being good?) I made it a point to return here for lunch. So here I am and exited (and disappointed) that there are eight promising items in the “Hand-Slapped” Burgers section and two non-beef selections. Which one to choose? This is an important decision because I mean it about eating right. Earlier in the blog I would return to places to sample most/all of the hamburgers on the menu. 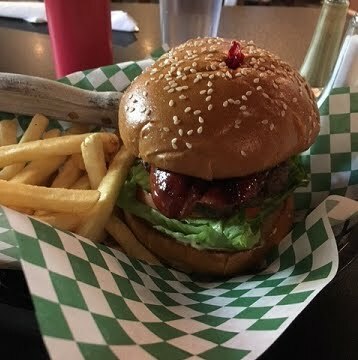 The huge burger is very juicy, and with the hot link it is quite messy, falling apart about two-thirds of the way through. I ended up eating the balance with a fork. The link was quality stuff. The fries were good, but needed ketchup, which isn’t a sin, still, I would have preferred thinner ones. So, while crying on my keyboard, let me tell you how the burger was: very good. And I imagine the others were very good, as well. Four of the other seven burgers that jumped our at me were the “Peppercorn Burger” with peppercorn spice, bleu cheese, the “Wedge Burger with apple wood-smoked bacon, bleu cheese and bleu cheese dressing. Pretty ballzy, but the “wedge” part is the whole thing is topped with a wedge of crisp iceberg lettuce! 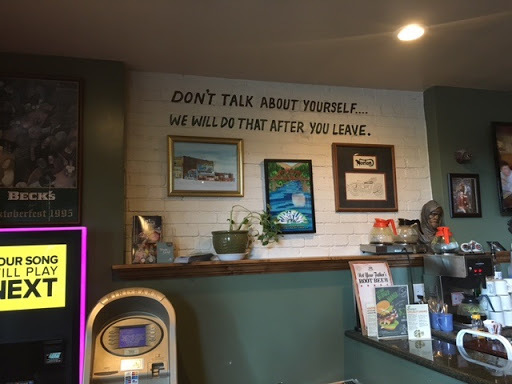 They also have a Bacon Cheddar Burger and a patty melt that sound good, as well.